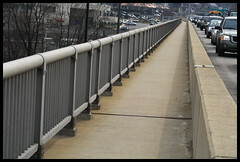 Street shot , crouched down on an overpass in Conshohocken, Pa.
To the left of the railing ........ Schuylkill River about 50-60feet down. To the right.... a steady stream of traffic that makes said overpass sway somewhat from the weight of the traffic, and a teeth chattering rumbling that courses the body. Now throw in a little vertigo... yes, that would be me crouched down on knee composing this shot.